GlobalData’s latest Consumer Payments Insight Survey has revealed that although e-commerce is growing rapidly all over the world, significant barriers still exist that keep consumers from regularly engaging in e-commerce. 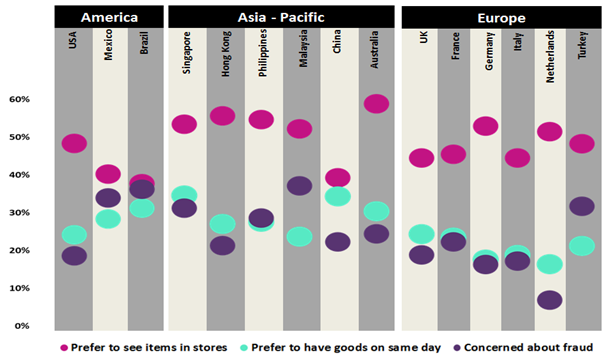 The importance of each of these barriers to e-commerce engagement varies by market, but across all the markets surveyed the preference to see items in-store is the single most important. In developing markets such as Malaysia, Brazil, and Mexico concern over fraud is high, with the proportion of consumers who don’t shop online due to fear of fraud being higher in these countries than the proportion who don’t shop online due to a preference for immediate physical ownership of purchased items. The inverse tends to be true for more developed markets – most notably the Netherlands – as well as for China (a developing market where 82% of internet users regularly shop online), implying that the more comfortable users become with the online channel, the less they tend to worry about fraud. In order to address the consumer preference to see items in-store, merchants have started providing more information online and are focusing on visualisation as a key aspect of the online shopping experience. Meanwhile, payment providers should focus on smooth and quick payment processes in order to avoid abandoned shopping carts. Despite the fact that in-store purchasing offers a better feel for purchased items, online shopping saves time, allows buyers to look for the best deals, check reviews from users, and is available 24/7. The preference to receive goods on the same day has caused companies to offer alternative solutions to the way items are delivered. Today’s impatient buyers prioritise speed and convenience when shopping either in-store or online, but they are reluctant to pay extra for it. As a result, companies have introduced click-and-collect options free of charge (e.g. Argos) or same-day delivery (Amazon Prime) to tackle this barrier. There is a need for payment companies and retailers to work together in order to achieve better results in accommodating consumers’ needs, both in the speedy delivery of goods and in quick checkout experiences. To tackle consumer fear of fraud, card schemes have included additional procedures when paying online. Security checks such as Verified by Visa or Mastercard SecureCode have given consumers greater confidence, although adding an additional authentication step could lead to frustration and shopping cart abandonment. Worldpay conducted a survey in the UK in June 2017 which found that over half (57%) of respondents find security checks like Verified by Visa necessary for their online payment security. Having a negative payment experience online or facing the potential of fraud will negatively affect online shopping. In the Netherlands only 6% of consumers expressed fraud concerns. Alternative methods of payment like iDeal or Klarna have become successful due to the convenience and security they offer, while alternative methods of payment such as ‘pay after delivery’ are also available. The internet-users who do not engage in e-commerce represent the most immediate untapped opportunity for online merchants and payment companies, as understanding their motivations for not shopping online is an opportunity to innovate. The online consumer payments market remains highly profitable. However, it is challenging due to the ever-evolving requirements and expectations of consumers as well as issues such as fraud. There is clearly a continued need for improved online shopping experiences and fulfilment.